Been slacking on the watch reviews, but with my just passed birthday, I received two new watches, and I have had one in my watch box that deserves some attention. Interestingly, they are all Seiko movement chronographs, so I get to compare and contrast. This is article one of three. 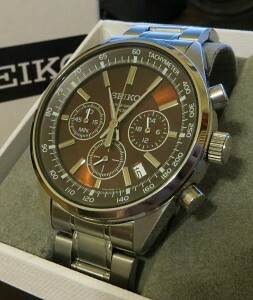 First off is a watch my lovely wife got for me, a brown Seiko chronograph, the SSB041. 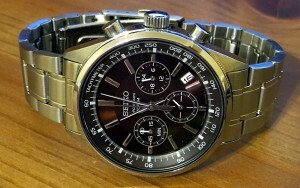 This is my first Seiko branded, quartz chronograph. I wanted a brown dialed watch, since I didn’t have any in that color, and I wanted a chronograph, with a 1/5 of a second feature, and a tachymeter scale. This watch fits the bill nicely. The dial is a radial sunburst brown which shifts colors depending on illumination. The outer tachymeter chapter ring is in a matte finishing and compliments the dial. The watch has three sub dials. At the nine o’clock position minutes accumulator for the chronograph function. At the six o’clock position is the running seconds dial, and at the three o’clock position is a 24 hour dial. Each of the sub dials uses a simple, white painted stick hand which contrasts very well against the dial. The hour and minute hands are dauphin style with a white stripe running down the center. The 1/5 second chronograph hand is a simple stick with a large tail. This tail is needed for the fly-back mechanism. The hour markers are simple, highly polished sticks. The date window is at the 4:30 position. Overall, the dial is relatively uncluttered for a chronograph and is well balanced. There is no luminous material. The movement is a 1/5 of a second, 1 hour fly-back movement. The upper pusher starts and stops the chronograph, and the lower pusher resets. The hands fly back instantly to 0, and do not step back meaning it is done mechanically, not with stepper motors. When activated the chronograph hand advances in very even, 1/5 of a second steps, very closely resembling a mechanical chronograph. The crystal is flat Hardlex, typical of Seiko and covers the tachymeter scale and is held down with a polished bezel. 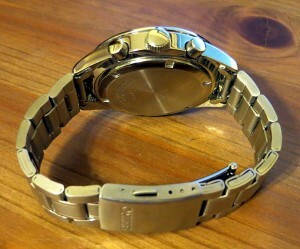 The case is stainless steel, 40mm in diameter. Brush on top with a high polish on the sides. 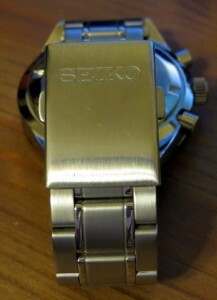 The case back is stainless and screw down and marked with the usual Seiko, 10ATM water resistance. 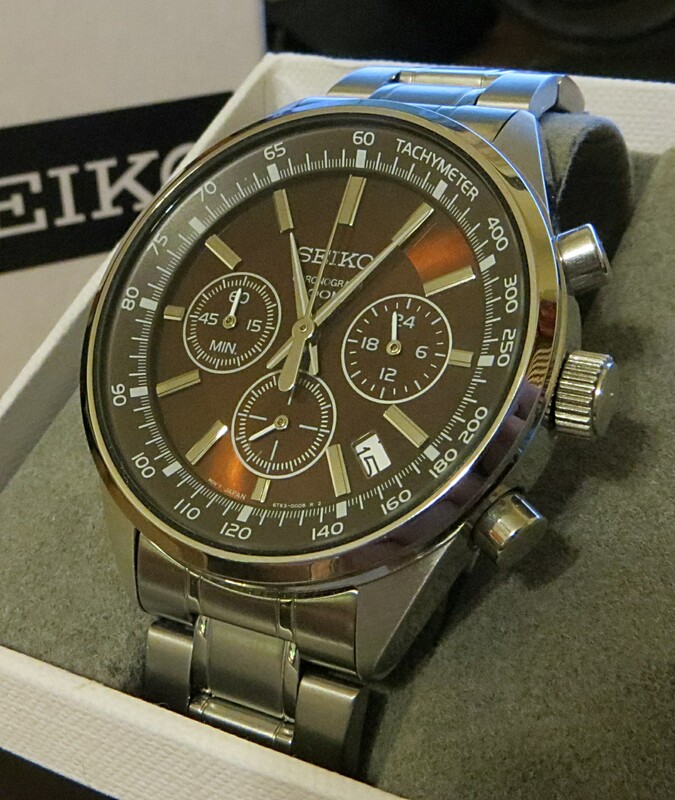 The quality is typical Seiko, very very good for the price point. The crown in unsigned, but large and easy to use. The pushers are polished and have a solid click when depressed. The lugs are 20mm to make for easy bracelet to strap swaps. The bracelet is a obviously inspired by Omega Speedmaster bracelets with a combination of polished and brushed links. The bracelet tapers to 18mm at the clasp. The bracelet is folded links, with a brushed finish on the sides. 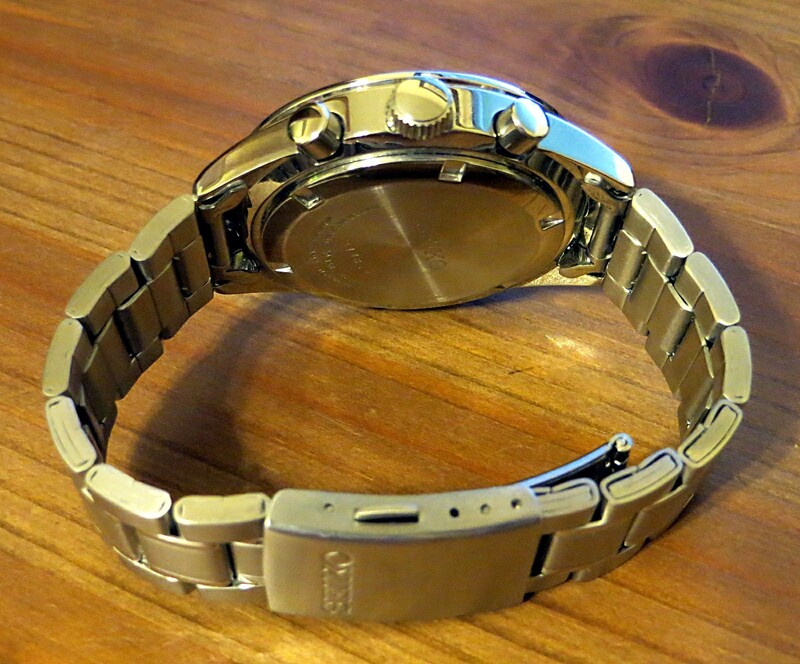 A solid link bracelet would be nice, but as is typical, would not be found in a watch at this price point. It does not grab hairs and is good quality with only minor squeaks. The end links are hollow. The deployant clasp is a two push button design without a safety lock. 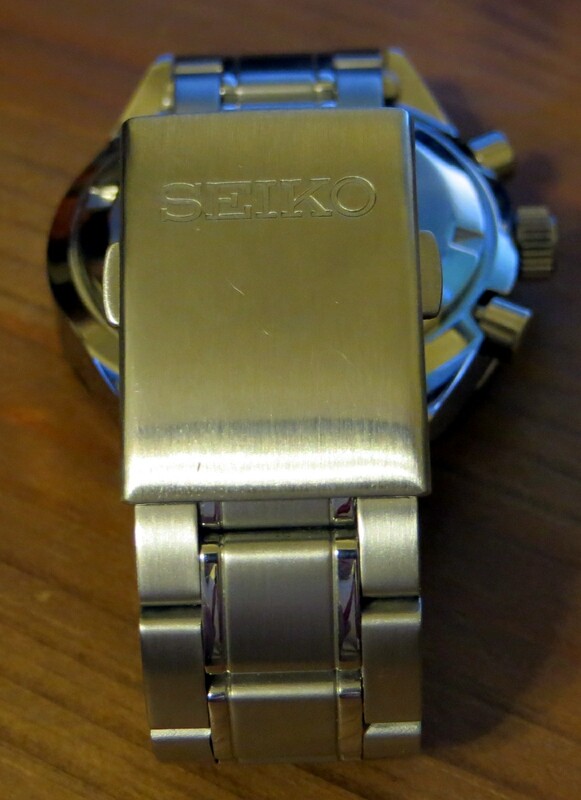 It is marked deeply with Seiko and has a brushed finish. As you can see in photo above, you can see the alternating polished and brushed finish very reminiscent of Omega bracelets. It has three micro adjustment holes, making for easy sizing. Overall, this is a very easy watch to live with, and my first new Quartz watch in a long time. Honestly, I only trust one brand of quartz watches, and that is Seiko. The movement is made in Japan and so far is dead on accuracy wise. The 1/5 of a second tic is a great way to get a mechanical look without the mechanical price. Startlingly, the Seiko has a cleaner sweep chronograph than my Omega! (Which tends to have some jitter, typical of 7750 based chronographs.) The watch is well balanced and not terribly large. If you have typical or smaller wrists, this watch will wear well. I am looking forward to years of trouble free accuracy and reliability. Again, thank you to my wife for another wonderful watch. Case: 40mm diameter, stainless steel, 100m water resistance. Movement: Battery Operated Quartz, 6T62, Seiko in-house design. 1 hour, 1/5 second chronograph. Complications: Date, 1/5 second 1 hour chronograph, 24 hour indicator. Other: 20mm folded link bracelet, stainless steel.